Because they’re repeatedly used throughout the day, the knees are much more vulnerable to trauma and overuse than other joints in the body — which makes them all the more susceptible to arthritis. While arthritis in the knees shares the same causes and symptoms as arthritis in other joints, this condition can be particularly debilitating because it disrupts walking, bending, kneeling, and other essential activities. Fortunately, there are many proven treatments for arthritis in the knees. Osteoarthritis of the knee occurs when the joint can no longer support the weight of the body. Much like a rope frays after carrying a heavy weight for an extended period of time, the prolonged stress will eventually cause the cartilage to fragment until most of it deteriorates. While aging and excessive weight are common causes of this increased pressure on the knee, osteoarthritis in the knee can affect anybody of any age or weight at any moment of their life. In many cases, the first symptoms of it arise in middle age. The most common type of arthritis, osteoarthritis can be a natural consequence of use and overuse. Years of wear and tear slowly erode the cartilage in the knee, wearing the natural cushion between the bones away and increasing friction between the bones. As a result, the uncovered bones in the knee begin to grind against each other. In some cases, arthritis can be a delayed result of a traumatic injury, such as a fracture or a tear in the meniscus or a ligament. Since cartilage cannot regenerate by itself, any damage can lead to arthritis in the affected knee down the line. Your orthopedic specialist will recommend a specific course of treatment for your knee osteoarthritis based on several factors, including your age and the severity of the condition. Non-surgical treatments can provide temporary relief for less advanced cases, but if the condition continues to progress, it might need to be treated surgically with debridement of the joint or even a complete knee replacement. Refraining from any activities that could accelerate the condition Following a physical therapy program designed to redevelop the muscles and ligaments in the knee Reinforcing and stabilizing the joint with a protective brace Walking with a cane Taking anti-inflammatories such as ibuprofen or acetaminophen Receiving corticosteroid injections Gel/lubricating injections PRP injections Vitamin supplements. 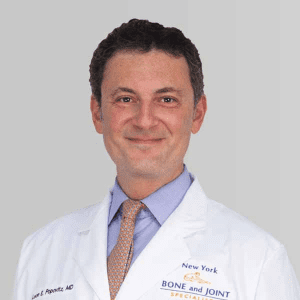 Book an appointment with NYC’s best orthopedic specialists to discuss your condition. Fill out the form below and you will receive a call from our office within 5-10 minutes. We’ll book an appointment at a time and location that work for you, and send you a reminder by email..